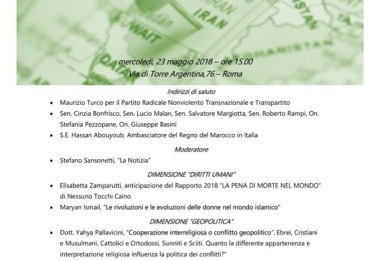 On 23 May, the Conference “The situation in the Middle East and the role of Iran” was held in Rome under the aegis of UANI and in cooperation with several NGO and think tanks, active in Italy, at the UN and internationally, for the promotion of human rights, fundamental freedoms, international justice, non proliferation of WMD, regional and global issues: Global Committee for The Rule of Law, Hands Off Cain, Nonviolent Radical Party, IsAG, Fondazione Luigi Einaudi. 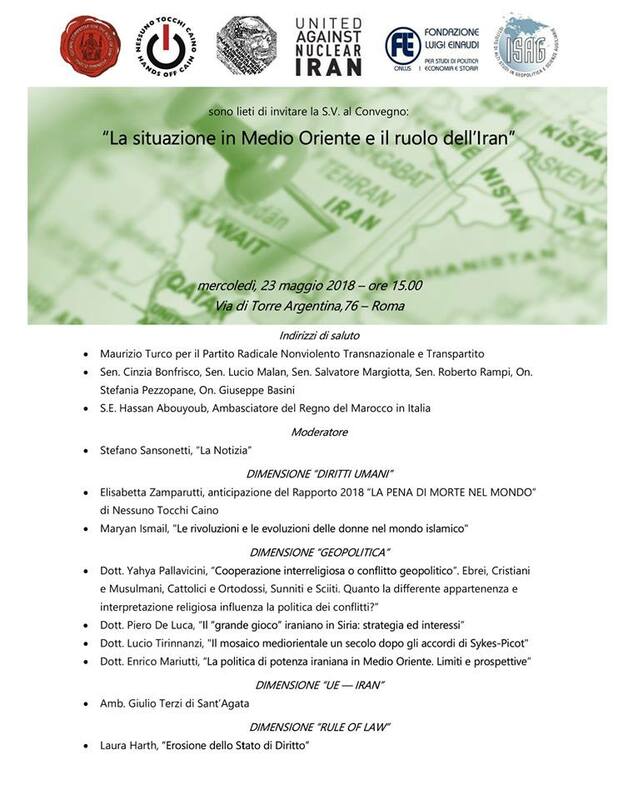 GCRL President Giulio Terzi underlined the efforts and the results obtained in Italy by UANI, raising awareness of the business community and Italian Institutions about the risk of doing business with Iran, significantly increased after the latest decisions by the USA Government. He also highlighted the necessity for Italy and the European Union to review Iranian policies and better respond to the challenges posed by Teheran. Speakers, including Ambassador of Morocco in Italy Hassan Abouyoub, addressed the faulty approach of the EU and especially of the Government of Italy: the complete absence of a clear European and Italian condemnation of Teheran’s violent repression; its involvement in terror activities; the continued and inexplicable Governmental promotion of doing business with Iran despide the news coming from Washington and the decisions taken by major companies to withdraw from Iran. Speakers did remind that the Iranian economy is widely controlled by the IRGC, and the risks for European companies. The EU is construed on core values and principles which are incompatible with its Iranian policy. EU members are willing to pouring money into the Central Bank of Iran in order to guarantee the European companies’ investments, in the attempt of bypassing the secondary sanctions imposed by the USA. Sen. Anna Bonfrisco, Sen. Lucio Malan and Sen. Roberto Rampi recalled that amendments were presented in Parliament to the Budget Law in order to stop the Government initiative to provide financial support and guarantees to exporters and investors in the Iranian market. But their attempts were overruled and the Government created “Invitalia Global Investment”, an entity with a credit line of 5 billion Euro financed entirely by public money, which will cover losses Italian enterprises may suffer in Iran. 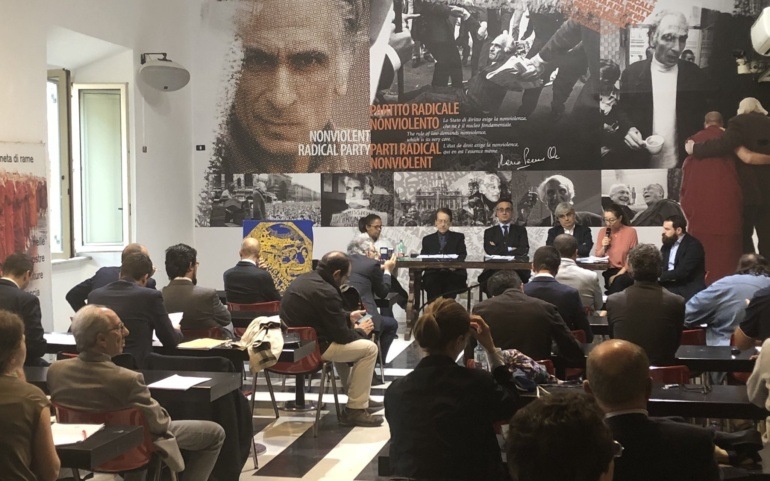 Italian MPs, foreign and Italian Diplomats, journalists and researchers expressed deep concerns for massive violations of human rights, conditions of women, large number of executions, violent repression of last winter’s uprising, involvement of Iranian regime and its proxies in destabilizing the region with IRGC commanders, men and weapons.